Tazreen from Keele University has kindly written this blog post for us about her experiences with fundraising, so far she has raised over £350 in the last three months, read her article below to see what she has been doing to reach her target. 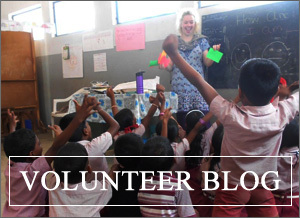 VESL provides amazing opportunities for young people to volunteer overseas and contribute to so many children’s education: something I believe in strongly as I study education and intend to pursue a teaching career. I chose VESL because of what it believes in and the opportunities it provides for children and volunteers. I chose to go to Thailand as it is rich in a culture I have, never in my life, experienced! The Trip is less then 4 months away and I am just over 46% of the way there in 3 months. 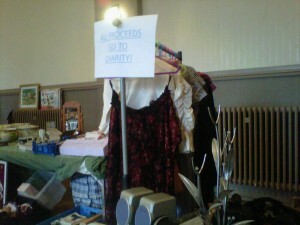 Fundraising can be daunting. Like this article, when it come to fundraising the hardest thing is knowing where to start; it can be difficult to come up with ideas for fundraising as well as where you are going to fundraise, the likeliness of success and partialities. A great starting point for me was reading through the VESL Fundraising pack; it has some fun and innovative fundraising suggestions – I recommend a good read through the pack and maybe circling ideas that seem plausible and appeal to you. I’m not really one to go on social networking sites, but my sister suggested that I make a Face book event page to keep people informed of fundraising events. 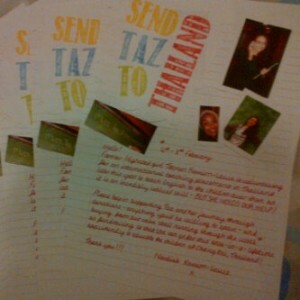 Within a day of creating it I had around 30 people going to ‘Send Taz to Thailand’ and now I have nearly 100. At first, when I was still organising events, I would post a fact about Thailand whether it be geographical or cultural to keep people engaged. I also, made the page so the friends that I ‘invited’ could invite their friends to build up support. When it came to Individual events, my lovely younger sister back home made some eye-catching poster to put around school to promote her cake sale. It’s truly amazing how many people give you money if you ask; I created a just giving page in less than 20minutes, after a week I had over £100 from the generous donations given. I am always sure to thank the people who donate either through the page, inbox message or text so they know how much I appreciate their support. The best part was that it was mostly friends, family and people from back home including from my secondary school which made me realise that just because I moved far away doesn’t mean that I have been forgotten – it’s a worth while cause and I’m sure it will be an incredible experience, and people are able to recognise this if you promote it well, ask nicely and show your appreciation. Being so far from home and knowing few people makes it difficult to envisage a successful fundraising event; this is when I reached out to the people who know me. My father and sister are great at baking so asked them to channel their talents to help me with my educational quest! My mother is running a fortnightly indoor boot fair at my old place of work in my home town; the stuff in the boot fair is the result of a major loft raid! Friends are more than willing to help; one dear friend from back home suggested the idea of a Talent show when everyone goes back home in the Easter break – I am in the process of writing a formal letter to my old Head teacher asking permission to use the school hall as a venue; a backstage team is being set up, acts being accumulated and it’s great to have the help especially as I have found myself to be extremely busy this university semester. I have also tried to get involved with group activities, for instance, there is a film night in a couple weeks that I have volunteered to help out at. Don’t be afraid to get involved and don’t be afraid to ask for help if you are struggling! As in most cases, there are a few times where things don’t quite go to plan. For instance, I have sent roughly 30 letters appealing to relevant companies and charities to help financially…the one’s I got back were unable to help due to the economic climate; therefore, I did not take it personally. I am still writing to trusts and foundations and researching in to it as it doesn’t hurt to ask. With the cake sale at my sister’s school; the first sale was extremely successful, the next few were not as much so instead my sister walked around school with a bucket and promoted the Just Giving Page I had created. I have always believed in back-ups and sometimes think what if I don’t achieve the full amount? What if I’m a couple hundred off? Since I am working I am making sure that I save my money and am careful with it on a day-to-day basis just in case I need to dip in to it later on. There are times when it’s quiet on the fundraising front but this should not dishearten you as there are so many opportunities if you just look, don’t panic and stay positive. I hope the above article inspires you to keep on track with your fundraising and that you all have an incredible time as a VESL Volunteer in the summer – I know I will. If you would like to help Tazreen reach her target you can check out her Just Giving page here.